Synopsis: Expand the world inside without turning on a screen even on a rainy day. Twenty-five projects and activities will keep readers occupied as they make a comic book, learn sign language basics, write a play, and more. About the Author: Eva Sassin is a freelance illustrator born and bred in the buzzing city of London. She has always loved illustrating, whether it be scary, fun monsters or cute, sparkly fairies. She is constantly drawing and carries a sketchbook everywhere . . . she has even drawn on the back of receipts if she's forgotten it! Eva loves combining her characters with unusual textures to give them more depth and keep them interesting. In her free time, she travels around London to visit exhibitions and small cafes where she enjoys sketching up new ideas and characters. She is also a massive film buff! 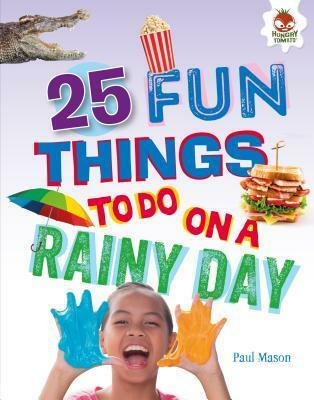 My Review: Rainy days are nothing new here in Florida so this 25 fun things to do on one of them was a gem of a find!! We haven't done any of the crafts in here as of yet. But April is right around the corner and that means that rain is not to far behind. So keep an eye out on our social media accounts to see the projects from this amazing title. The activities look fun and easy to do and we can not wait to dive right in!! Go Into This One Knowing: Great for all ages!